A competitive fleet of nine AC45 catamarans skippered by some of the world's best sailors combined with unsettled wind conditions to produce an exciting opening day at the America's Cup World Series Naples. Ben Ainslie's J.P. Morgan BAR crew hold the early lead in the series. 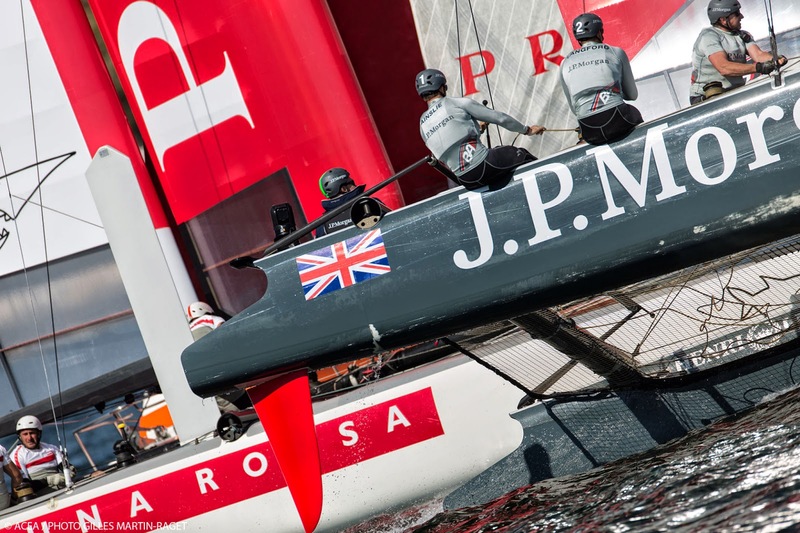 They scored 21 points after placing 3-1 in the two fleet races and lead Dean Barker's Emirates Team New Zealand crew by 1 point. 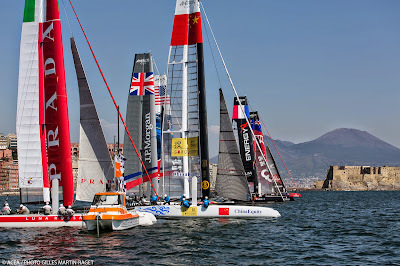 The Kiwis finished 1-4. 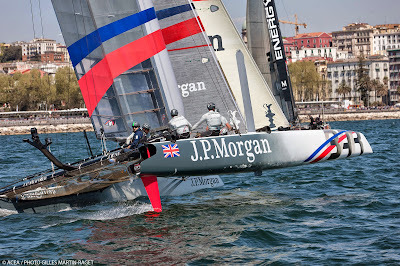 J.P. Morgan BAR also scored a come-from-behind win in its quarterfinal race of the match racing championship in testing conditions that kept all 45 of the sailors piqued trying to decipher the tricky wind conditions. "It was one of those days when you want to survive because it would have been easy to pick up some bad results," said Ainslie, the four-time Olympic Gold medalist who had the British Ambassador to Italy, Christopher Prentice, aboard as a guest racer. "The wind was so shifty today coming over the headland. That was the biggest challenge." Reports from the race course on the Bay of Naples indicated that the wind was shifting from south/southwest to nearly west, an arc of some 35 degrees, and ranged in strength from 8 to 12 knots. 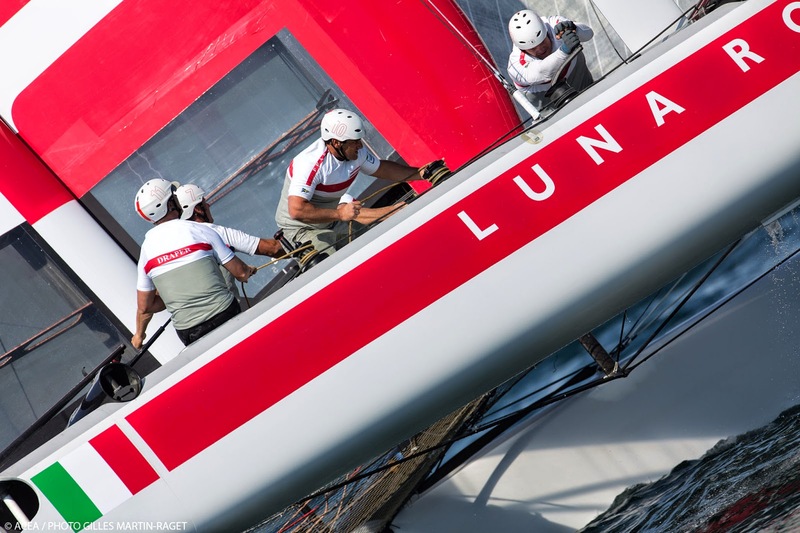 In today's match racing action, newcomer HS Racing, led by co-skippers Roman Hagara and Hans-Peter Steinacher, won the qualifier match in a "walkover" when opponent China Team was disqualified for failing to start properly. Two of four quarterfinal matches were also held today. Luna Rossa Piranha defeated Artemis Racing White (Charlie Ekberg) in one match while J.P. Morgan BAR defeated Energy Team (Yann Guichard) in another. 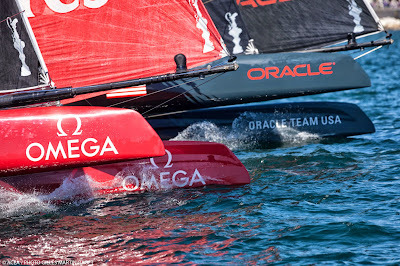 The quarterfinals will conclude tomorrow with HS Racing squaring off against Oracle Team USA (Tom Slingsby) and Emirates Team New Zealand racing Luna Rossa Swordfish (Francesco Bruni).